Currently my mind is awash with various ideas that I want to write about but nothing much of value seems to be coming out of all this muddle. You know that feeling when you have so many ideas that you can’t really settle on any of them? Yeah, that’s where I am right now. It’s times like this that I so desperately need to write & yet often when my mind is so overwhelmed like this I sit down to write & the words run away from me the way I run from a snake when I see one. In all of this madness the two quotes at the beginning of this post keep coming back to me. I’ve heard that Miranda Lambert song on the radio a few times lately & I keep finding myself looking it up on YouTube to listen to it again because the words strike such a chord with me. 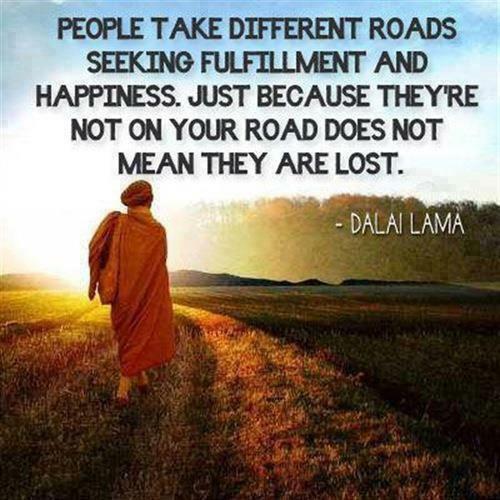 The Dalai Lama quote is something I came across on Facebook last week & instantly loved. This idea that there is no one right way for everyone is one of those universal truths that as an adult I keep stumbling upon. I stay stumbling upon because it’s an idea that I really cherish & yet it’s one that I think we all struggle to really remember from day to day. I don’t have any scientific backing for this, but I’m pretty sure it’s wired into our DNA somewhere to compare ourselves to each other, perhaps women being the worst perpetrators here. As much as I love the internet & truly believe that social media can enhance our lives for the better, sadly such things can also encourage that innate drive to compare ourselves to everyone around us. The unfortunate result of such comparisons is usually one of two things. First, we often find ourselves feeling inadequate because we inevitably see others who we PERCEIVE are prettier, skinnier, richer, smarter, more successful, etc than ourselves. Second, we often find ourselves criticizing others because we do not agree with certain aspects of our lives. I believe it is a sign of our own insecurity that we are so often quick to judge others instead of relishing the fact that not everyone is just like us. Instead of feeling either inadequate or self-righteous when we see others living differently than us, we ought to be thankful that in truth “to keep the world spinning, it takes all kinds of kinds.” Just think how boring the world would be if we were all alike? One of the greatest lessons I’ve learned in life is that when I open myself up to new ideas, new ways of thinking, & new experiences, that is when I really learn & that is often when I feel most alive. Now I realize this thought process could lead to some dangerous territory if we took it too literally. Obviously there are some things like child molestation & murder that as a society we have to reject as immoral. We cannot accept ALL behaviors or else the world would be even more chaotic than it already is. As with almost everything in life, it all comes back to “everything in moderation.” I truly believe if we could all learn these concepts, the world would be a better, more peaceful place. As I’m writing this I sincerely hope I don’t come across as arrogant or preachy. I’m as guilty of not following these principles as anyone. But I’m working on it. And that’s what matters: the everyday continual process of effecting change, & that process always starts inside each & every one of us. As with everything, some days it will be easier than others. And some days it will be harder. I am grateful that I have so many friends from so many different walks of life with so many different belief systems who continually challenge me & help me to become more & more tolerant, educated, & compassionate toward the world at large. Y’all know who you are. And I thank you for accepting my Type A, mildly OCD (but only about some things! ), high-anxiety, questionably crazy kind. Love is Blind . . . Or Is It?